The Choirs at Virginia Wesleyan are a place for anyone who wants to make music, regardless of their skill level. The Wesleyan Choirs have a long tradition of high quality performances, including performances across the Eastern seaboard, Carnegie Hall, and will be performing in Florence and Verona, Italy in June 2019. The choirs perform a variety of music from all styles and genres, as well as several world premieres by composers such as Timothy Takach, Paul Carey, and Andrew Maxfield. Come join the Choirs and find your home at Virginia Wesleyan! Bravura is an open-enrollment choir that offers freshmen and non-majors a venue to sing quality choral music from a variety of styles and genres while they develop their skills as a singer and as a musician. The choir performs once per semester and engages in service learning opportunities as part of their performances. No audition necessary. Camerata is an auditioned ensemble of 30-40 singers (freshmen-seniors) that sing repertoire from the standard choral canon, including major works with orchestral accompaniment. 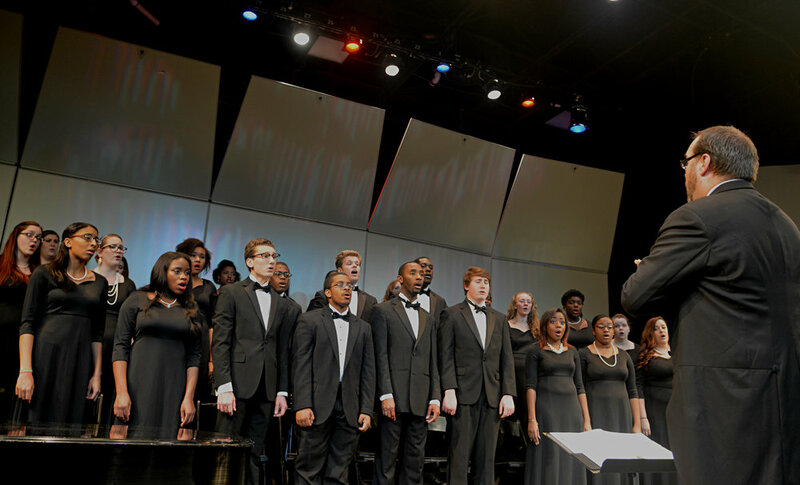 As the flagship ensemble of Virginia Wesleyan, this choir tours regularly. Students must be enrolled in Bravura or have already taken it for one year. Audition required. Vox Vera is the top chamber ensemble in the Virginia Wesleyan Choirs program for sophomores, juniors, and seniors. An auditioned mixed choir of 12-16 singers, the choir singers entirely unaccompanied music from a variety of styles and genres, including a capella, jazz, and contemporary music. This ensemble will participate in regional and national tours along with Camerata. Members of Vox Vera must pass an audition and sing in Camerata. Dr. Bryson Mortensen is Assistant Professor of Music, Co-Chair of the Music Department, and Director of Choral Studies at Virginia Wesleyan University, where he conducts three choirs and teaches courses in Music Education and Music History. Dr. Mortensen has received a Bachelor of Music in Vocal Performance and Master of Music in Choral Conducting from Brigham Young University and a Doctor of Musical Arts in Choral Conducting and Performance Literature from the University of Illinois at Urbana-Champaign. Previous to his time at Virginia Wesleyan University, Dr. Mortensen was the Director of Choral Activities at the University of Wisconsin-Rock County, Artistic Director of the Festival Choir of Madison, and Chorus Master of the Wisconsin Chamber Orchestra. Dr. Mortensen has performed as a vocalist with professional and semi-professional choruses and has performed as soloist in a variety of oratorios - including Handel’s Messiah, a variety of J.S. Bach Cantatas, Mendelssohn’s Elijah, and Carissimi’s Jepthe. Dr. Mortensen is a sought after guest-conductor for festival choruses and district choruses across the country. Most recently, Dr. Mortensen has conducted the Young Singers Project of the Virginia Chorale, which has been a subject of the recent PBS Documentary #youngsingersproject (June 2018) and the Emmy-Nominated feature on the arts series, “Curate.” Dr. Mortensen had his debut conducting engagement at Carnegie Hall with MidAmerica Productions, where he conducted a festival chorus of over 125 singers and orchestra in W.A. Mozart’s Missa Solemnis in C and has been invited to conduct Dan Forrest’s Lux:The Dawn from on High in Florence, Italy in June 2019. Dr. Mortensen believes in the power of choral music to give us the opportunity to explore the human experience through the eyes of both poet and composer and to be able to change the lives of both singer and audience for the better.